Yes, the construction machine on the picture was operational when I took the picture. But I swear that I did not hear anything in the hallway of the Telegraaf hotel in the old town of Tallinn (Estonia, Europe). I had a great night rest, and I was happy that my meeting was scheduled at 10.30 am. So I still had some time for breakfast. 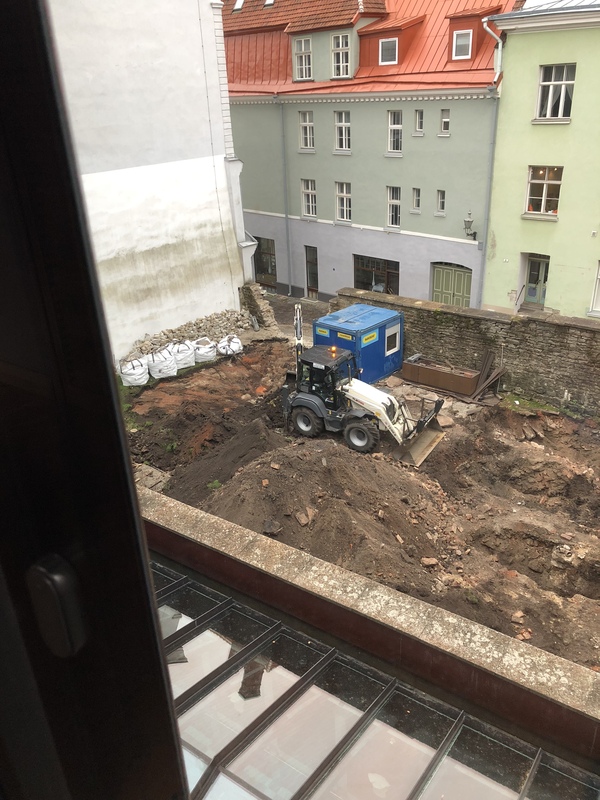 When I stepped out of the room, I suddenly realized there were construction works in what used to be the garden of this hotel. I remember having a coffee outside last summer, when I visited Tallinn. Now the machine was doing some land works there … and I did not hear it. That’s when I realized I also had not heard any sound inside the room this morning. For the sake of this blog post, I went back in the room and looked at the courtyard at the other side of the hotel. There were cars parked, but I had not heard any of them entering the car park this morning. When I checked the window I saw they use to window frames and inside the window frame there is double insulated glazing. That’s how a hotel should be designed. Hotels are meant to sleep, in the first place. But a good night’s rest is too often considered as a commodity – not worth any investment. Some hotels even add events to make money, and they consider guests that have difficulty sleeping as annoying people. I had this in a very posh hotel in Porto (Portugal, Europe): the Yeatman hotel. Fantastic hotel, great view on the Douro river, but don’t go there when they organize an event. The rooms are below the stone-tiled event room, and they do not mind moving metal tables and chairs after midnight, to prepare the event room for the morning breakfast. Even after I called the reception twice that night to stop moving the chairs, they said “sir, we have to prepare for breakfast, and you have to understand that we have to organize these events to make money”. Well, they got a very bad review on tripadvisor, and I tell everyone NOT to go there. But hey, that’s another story, we are at the other side of Europe now, in Tallinn (Estonia). The point is, a great night’s rest starts with sound proof windows. That is serious investment, but it definitely pays back on the long term, when customers come back after they realize they have slept well. This hotel aims at customers that come back. And that’s what I will definitely do. Thank you Telegraaf hotel. Here is their website: www.telegraafhotel.com. Enjoy Tallinn. Next How to reduce smartphone irritation in lobbies, restaurants, and lounges?